I've been looking at old maps and photographs of Emporda to get a sense of how the countryside has changed over time. 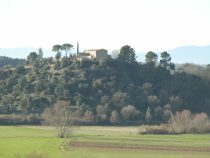 Emporda is an ancient land - it was settled originally by Greeks, then came the Romans and after the Romans came Visigoths, Muslim invaders and then the Franks. Catalonia itself is one of the Spanish Marches - that is a body of land separating two opposing forces as a kind of buffer state. 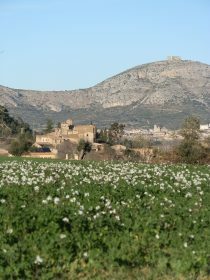 As a result it is a land which is full of castles and towers and fortified villages on top of hilltops. 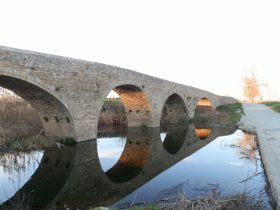 The other feature of Emporda is water. If you look at old maps you will see the coastline changes over time. For instance Pals was once on the sea and Torroella had access to the sea along the Ter. Over the centuries the lowlands and marshes at the mouth of the rivers Ter and Fluvia (and Muga higher up) have been drained and dried out. One intriguing feature on older maps, even to the early 20th century was that there were several inland lakes marked and routes and areas described as Estany - or lake in Catalan. 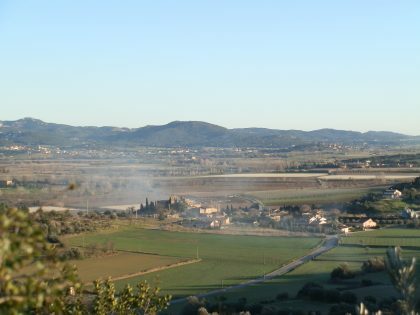 One of the largest of these is the lake of Ullastret - a large (3km long) depression now completely emptied, but in the past a broad body of water between Ullastret (the Iberic village of Ullastret would have stood above the lake), and the hills of Llabia/Fontanilles on the other side. Reading the history, the lake itself was drained mechanically with a steam-engine taking about 30 year to pump out the water between the 1850s and 1880s. It would probably have been smelly in summer as it dries out - so locals were all in favour of drainage. Apparently in heavy rain parts of this lake can re-appear. The walk starts at Gualta. There is parking near the old bridge over the Daro. The first part of the walk is on the road to reach Llabia - it means walking on tarmac, but the road is quiet with very little traffic. 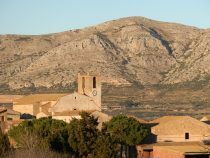 Llabia is a small village on a hill with broad views in all directions and particularly good views of the Pyrenees. We walked through the village and out the other end along the Carrer Major (like many 'main roads' in small old villages it isn't really 'major'). One of the streets you pass at the end of the village is Carrer d'Estany showing how the lake is captured in the place names. Continue out and Carrer Major turns into a gravel track with what would have been the lake to the right. The lake bed is now a collection of what look like very fertile fields beneath you and across the 'lake' extremely clear views to the mountains. On the other side of the lake you should be able to make out the village of Ullastret and the museum building for the Iberic village. The road continues south past olive groves to a cross roads at the end of the hill on your left. Turn to the left and follow the path to Fontanilles. Fontanilles is actually on the GR92 and looks over the bay of Pals. The village is a little bit tumbledown and unkempt. For me this is less pretty than the view across the lake on the other side of the hill so if you are walking the GR92, you might consider a diversion. Nonetheless, the path from Fontanilles climbs up the hill past the cemetary. 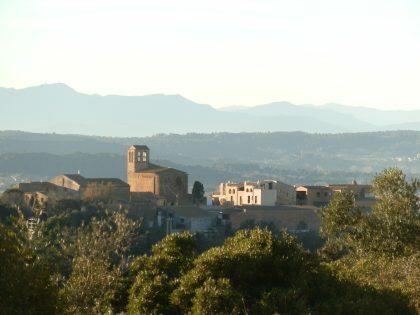 At the top is a viewpoint with views to the south to Pals and Palafrugell and to Torroella and the Isles Medes to the north-east. Follow the path down the hill and then turn to the right to get to Gualta. The village has a character to it without necessarily being particularly photogenic. Before the church is an old mill with water conduits that would be used to control the water entering into the bay of Pals. Pals has a large and complex system of irrigation for the rice paddies with water coming from the Daro (via Gualta) and the Ter. Continue past the church and back to the old bridge. You can see the tracks worn by the carts as they crossed the bridge to get to the Torroella road.